But it was learnt late on Saturday that Justice Gabriel Kolawole rejected the motion last Monday. The judge ruled, “In terms of the restraining orders, which the plaintiff seeks in the prayer one of his motion ex-parte, I am unable to grant the prayers because the plaintiff has not been able to overcome the issue of his locus standing, which I had raised at the proceedings of 27 July, 2015. 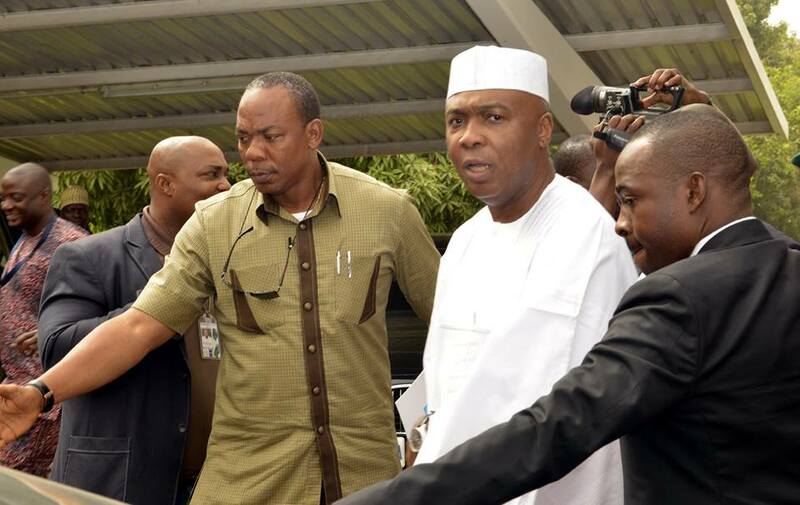 The Federal Government had on June 10, 2016 preferred two counts of criminal conspiracy and forgery of the Standing Rules of the Senate used for the leadership election of the presiding officers of the Senate in June last year against Saraki; the Deputy Senate President, Ike Ekweremadu; and two others. The two other co-accused are a former Clerk to the National Assembly, Salisu Maikasu, and his deputy, Benedict Efeturi. Justice Kolawole however described as “an abuse of court process” the decision of the AGF to file the forgery charges during the pendency of a suit filed by the plaintiff challenging the competence of the police report. The judge said, having found that the filing of the charge amounted to an abuse of court process, he would have proceeded to dismiss it, but for the charge pending before the High Court of the Federal Capital Territory, with a coordinate jurisdiction with his court. Nnaji had filed the substantive suit on July 23, 2015 upon learning that the police was about to publish its investigation report on the forgery reported to it through a petition by Senator Suleiman Othman Hunkuyi of the Unity Forum. On July 27, 2015, the judge refused the plaintiff ex-parte prayer for an order directing parties to maintain status quo pending the determination of the substantive suit, and instead, directed the 1st defendant — IGP — (because a substantive AGF had yet to be appointed) — to show cause as to why such order should not be granted and adjourned to August 4, 2015. On the next date, the IGP and the Solicitor General of the Federation, Taiwo Abidogun (who represented the AGF), did not show cause as ordered by the court, but filed a notice of objection challenging the jurisdiction of the court to hear the suit. Hunkuyi, represented by a team of lawyers including Mamman Osuman (SAN), Dele Adesina (SAN) and Abubakar Malami (SAN), applied to be joined as party to the suit. Hunkuyi’s motion was later struck out when his lawyers did not attend court to move it. While the substantive case by Nnaji and the notices of objection by IGP and AGF were pending, Malami was appointed the substantive AGF, shortly after which Justice Kolawole fixed hearing of the suit and all pending objections for July 6, 2016. To stop the arraignment of Saraki, Ekweremadu and two others named in the charge, Nnaji went back before Justice Kolawole with the ex-parte motion for restraining orders against the IGP and AGF. The motion was heard on June 27 by Justice Kolawole, who fixed June 28 for ruling. Saraki and others were also arraigned before the High Court of the FCT on the charge filed by the AGF June 27. In his ruling on June 28, Justice Kolawole faulted the decision of the AGF to proceed to file a charge based on the police report when the suit challenging the report was still pending. He held that although, as the AGF, he had the constitutional powers to institute and discontinue criminal proceedings on behalf of the Federal Government, he must exercise such powers in public interest. Justice Kolawole noted that, although the charge was filed by a lawyer in the Federal Ministry of Justice, the official acted as an agent of the AGF, who was listed as one of the leading senior lawyers that filed an application for joinder on behalf of Hunkuyi, who until his (Malami’s) appointment, was his client. He, however, refused the applicant’s request to quash the police report on the grounds that the report was not attached to the motion and that it was not placed before the court. Justice Kolawole also refused to void the charge before the FCT High Court on the grounds that the charge was before another court of equal jurisdiction. Meanwhile, the crisis in the leadership of the Upper Chamber of the National Assembly has taken a turn for the worst as a cold war has started between Saraki and his deputy on one hand, and the Leader of the Senate, Ali Ndume, on the other hand. Investigations by our correspondent, in the last one week, revealed that trouble started when Saraki allegedly discovered that Ndume was not on the same page with him on the crisis he was having with the Presidency. A ranking senator, who craved anonymity because of the sensitive nature of the issue, confided in one of our correspondents during the week that Saraki suddenly discovered that Ndume, who was allegedly close to the Presidency, was no longer pleading his case whenever he was in the Villa. The senator explained that since his emergence as senate leader, Ndume allegedly warned Saraki to be wary of Ekweremadu and other members of the Peoples Democratic Party in the red chamber who might want to pitch him against the presidency. He was said to have specifically advised Saraki to avoid any form of confrontation with President Muhammadu Buhari, but should rather do everything possible to support his administration, so that the latter would extend a hand of fellowship to him. The source said, “The trouble between Saraki and Ndume started when some of Saraki’s ‘men’ in the Villa started feeding the Senate President with reports of how Ndume had allegedly joined members of the Senate Unity Forum to work against him and Ekweremadu. “Don’t forget, Ndume contested for deputy senate president against Ekweremadu in this Eighth Senate. His initial intention was to be senate president before realignment between him and Saraki made him to settle for deputy senate president. Attempts to speak with the Senate President on the issue failed as he is currently on Lesser Hajj in Saudi Arabia, while calls put across to his deputy did not also connect. However, when contacted, the Senate Leader denied knowledge of any face-off between him and the presiding officers of the senate. But some of Saraki and Ekweremadu’s aides, who spoke with one of our correspondent off the record in separate interviews, confirmed that Ndume was no longer on the same page with the Senate presiding officers. Likewise, an aide to Ekweremadu, who equally spoke on condition of anonymity, acknowledged the crack in the Senate leadership, stressing that Ndume had finally fallen apart with Saraki and his boss.